a hearing Tuesday on various rent measures. 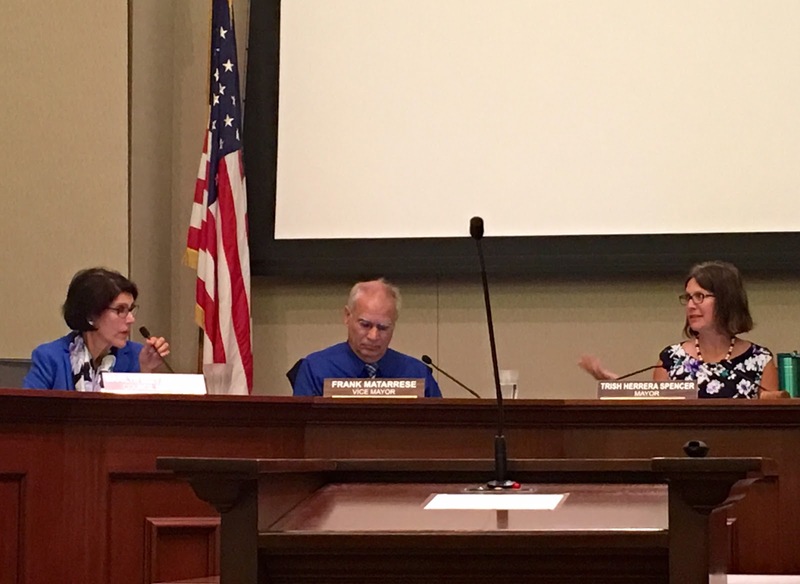 Alameda Mayor Trish Spencer said Tuesday that she unequivocally opposes the tenant-driven rent control initiative now slated for the November ballot. The stance is not surprising. She has told the renters’ group the same thing in private, but Tuesday’s declaration may be the start of Alameda leaders taking stands on this most contentious issue. While the Alameda City Council discussed various scenarios this week that include up to four different potential rent-related measures in the fall, Spencer, a long-time renter herself, said she does not support the renters’ cause, but did not voice an opinion on the landlords’ competing initiative to ban rent control. That measure is still awaiting certification from the Alameda County Registrar of Voters. Spencer, though, was the only member of the council to support placing the rent stabilization ordinance it passed last March on the ballot. Its inclusion in a staff report, though, caused some displeasure among the council and tenant advocates. “I would have preferred it not be in the staff report,” said Councilmember Marilyn Ezzy Ashcraft. “I was upset because it contradicts [the rent ordinance’s] flexibility.” In the unlikely event the ordinance is placed on the ballot and actually wins, its ability to be tweaked would be severely diminished. Because it would be a charter amendment, making changes to it would be onerous and only through the ballot box in future elections. Ashcraft noted the originally underpinning of the ordinance is to monitor its early progress on a yearly basis and allow for changes, if warranted. Members of the Alameda Renters’ Coalition claim the introduction of the ordinance as a ballot measure is intended to confuse voters. Some residents, they say, already erroneously believe the ordinance passed in March enacted rent control restrictions. With the stakes of Alameda’s rent control issue high, there is an expectation of some political posturing and low-level chicanery over the next four months before Election Day. On Tuesday, Councilmember Tony Daysog offered to sit on a two-person committee tasked with writing a ballot statement opposing the renters’ initiative. Daysog has his own petition for an amendment to the rent ordinance that would roll back some tenant-related costs to whom he terms “small mom-and-pop landlords.” Daysog’s measure, however, is unlikely to amass the 6,461 signatures needed for inclusion this fall. Ashcraft, who is running for re-election against Daysog for two open seats on the council, immediately protested against what she believes is a conflict-of-interest. Later, after Daysog claimed “early returns” of the recently-passed rent stabilization ordinance is stopping incidents of excessive rent increases of up to 50 percent, Ashcraft scoffed. “I would love to believe that,” she said. Instead, the absence of such recurrences, may be due to tenants being too scared to confront their landlords. With a line in the sand potentially drawn with the rent control initiative qualifying for the ballot Wednesday, it appears Spencer and Daysog land closer to landlords than generally beleieved, while Ashcraft and Councilmember Jim Oddie lie somewhere closer to renters. Councilmember Frank Mataresse, while not particularly admired by the renters’ coalition, suggested Tuesday night that he plans to be neutral on this issue. He made it clear that he strongly opposes the council taking any stand on the measures through a ballot statement. NOTE: A change was made to this article regarding Daysog’s possible involvement in writing a ballot statement. Posted in Alameda, Alameda City Council, Alameda Renters Coalition, Frank Matarrese, landlords, Marilyn Ezzy Ashcraft, November election, rent control, rent stabilization, Tony Daysog, Trish Spencer. Bookmark the permalink. While price controls, and of course rent controls is a form of price controls, seem like a solution to rising prices, however in reality the longterm effects of price controls almost always are: one, skyrocketing prices, and in fact prices that in the long run become much higher than if price controls had not been instituted; two, much lower quality of the product for sale; and three, generally also a shortage of the product that people want to buy. So regardless of whether we institute price controls on rental units, the price of sugar, the price gasoline, or virtually anything else, you can be extremely confident that with price controls IN THE LONG RUN things will go to hell. Actually, the main beneficiary of price controls are certain sleazy demagogue politicians who, and who also increase their chances of winning re-election by their pretending they think price controls will work, gain the favor of certain overly gullible voters by saying they are in favor of price controls. In fact a few decades ago I listened to a TV interview of a prominent older politician who had a short time earlier retired, and he stated that back when he was still in office and regularly running for re-election, and so that the voters would like him, he supported and strongly pretended to be in favor of all sorts of “liberal” ideas that he actually realized were extremely stupid and longterm economic suicide, but now that he was retired from politics, and therefore no longer needed to constantly spew lies so as to get the support of the majority of the voters, he was willing to say that a lot of the “liberal” programs supposedly designed to “save” us and “improve” our lives actually IN THE LONG RUN will end up destroying both society and the economy. Tavares left out his spineless buddy Jim Oddie, who refused to take any sort of stand by abstaining from votes on the matter. Nice Econ 1 regurgitation. But what about the effects of decades of restrictive planning to favor existing owners and landlords by constraining supply? So find ways to increase supply and work to break the problems that are preventing it. Supply is the core problem that rent control can and will not ever solve. Rent control will lead to less supply and less quality. It's not subjective. Related to the post of 11:04, one of the best ways to increase the supply of housing – and increasing the number of housing units would help keep the price of rent from skyrocketing – would for the general public to stop automatically electing and re-electing scumbags who pretend to be great liberals and wonderful humanitarians. In NYC, in other words a city that is composed of and run by “liberals,” the main purpose of the vice squad is protecting, and also collecting under the table bribes from, the bigger and more powerful bookies and drug gangs, and while harassing and putting out of business the competition, in other words the smaller bookies and smaller drug traffickers. And usually before the NYC vice squad does one of its periodic “raids” of one of the bigger bookie joints, after all, it does have to pretend to be interested in oontrolling crime, the owners of the bookie joint are quietly tipped off about the imminent “surprise” raid so that they can remove most of the money and virtually all of the evidence, and gullible newspaper reporters are also informed of the vice squad's latest effort to “control” crime. However as long as NYC's mayor of the moment, and who usually is a Democrat, pretends to be a “liberal,” the general public almost always allows itself to continue to be fooled and hoodwinked, and therefore thinks that the big boys in City Hall are dedicated to helping the little people. In fact, keep that kind of thing in mind the next time Alameda County's Nate Miley tries feeding us his latest lies, garbage, and nonsense. I would like to say thanks for share that, Its great post.